Cullen Town Hall will now be sold to a hotel developer. The 19th Century building in Cullen has been identified by Milne Property Developments (MPD) to create an extension to the neighbouring Seafield Arms, which has been empty for more than seven years. However, due to the landmark being owned by the town’s common good fund an application needed to be lodged at Elgin Sheriff Court to allow the council to progress the sale. Yesterday that application was approved after two letters of support and no objections were lodged. 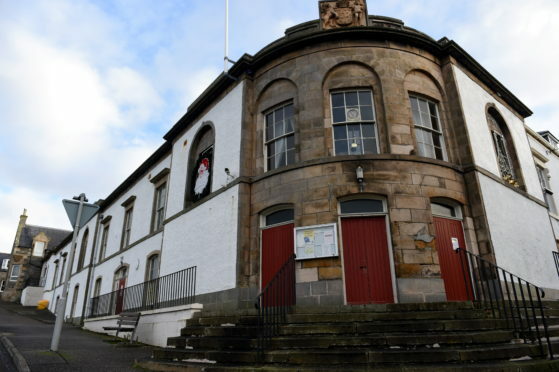 Cullen and Deskford Community Council had backed the process due to MPD’s plans involving retaining the ground floor of the venue for community use while the rest would be converted to a hotel. Estimates of £500,000 to restore the B-listed building for the use of the community have made the project unviable for locals to fund themselves. Last night, Keith and Cullen councillor Theresa Coull explained the commercial sale of the property would have multiple benefits for locals. She said: “It’s been an open secret in Cullen for some time that the town hall has been looked at as an extension to the Seafield Arms. “There have been issues with the building, especially the roof, which means that it would be too expensive for the community to restore themselves. Cullen Town Hall was built in the 1820s and was used as a cinema in the early 20th Century. It was rebuilt in the 1950s and was closed by Moray Council, which has managed the building until now, due to budget cuts. Yesterday the authority explained the plans would allow the building to be brought back into use. A spokesman said: “Our solicitors will now progress the sale of the property to MPD. MPD was given consent in 2016 to transform the adjoining Seafield Arms Hotel, which has been empty since 2011.